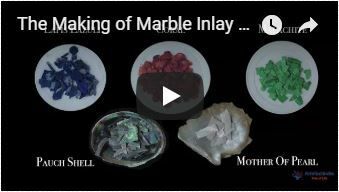 Marble inlay tiles or marble wall tiles are not made with clay, porcelain and cork. Marble tiles are made of Natural Indian Marble fully handmade inlaid with semiprecious stones. The white marble is from makrana it is the same place where we got the marble for the Taj Mahal in Agra India. The unique quality of the white marble is that its translucent with the light. This item is not only tiles. It is a piece of art which you will enjoy using them at your beautiful home all the time. You can use this as a floor tile, bathroom floor tile, kitchen floor tile and wall tile as a decorative piece in your home. The semiprecious stone inlaid into the marble wall tiles is Malachite. Once you get this you will appreciate this piece and its art work and it will also be appreciated by your guest and family members. The Marble Inlay Wall Tiles is made in Agra India & fully handmade. This piece of art used as a home decor. This is one of the finest art forms and you will love this piece.